Non-hideous yellow dresses – do we love them? | Do We Love It? Non-hideous yellow dresses – do we love them? Wish I could say “Happy Friday” to all of you, but today is not a happy day for me. Instead it’s a day of mourning – because today is my last day working with my co-d friend and work spouse Emily. She had the nerve to accept a new job at an office that is TWO WHOLE BLOCKS AWAY so clearly I will never see her again. You know what would make me feel better? Tequila. But since that’s not an option right now, you can all make me feel better by going to my last post and voting for my side to make sure I keep winning. Because I love winning. I can’t decide if this one is cute, or if it looks like a highlighter. I’m pretty sure it can’t be both. What I do like about this dress is the crochet-detail emphasizing the natural waist. What I’m not so sure about (in addition to the super-bright shade of yellow) is the crochet band around the thighs. No woman wants to emphasize those. 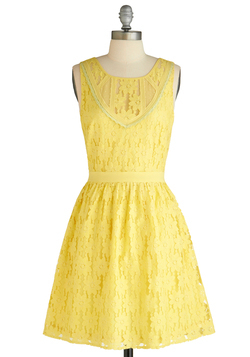 This one is probably my v. fave of all the yellow dresses. Imagine how cute this would be with a wide tan belt and some fun platform espadrilles. Unfortunately, this one is also the v. hardest shade of yellow for anyone to pull off. I think it’s no coincidence the model’s head is chopped off on this one because this shade of lemon yellow has a tendency to make both blondes and brunettes alike look like they are dying from consumption. This entry was posted on Friday, May 4th, 2012 at 2:39 pm	and posted in Uncategorized. You can follow any responses to this entry through the RSS 2.0 feed. « Emilio Pucci Appliqued Silk-Charmeuse Dress – do we love it?